Upgrade to a service plan to have our Experts complete CanIRank tasks for you! April 24th, 2019: Activate a paid plan to get 7 days free!
? Unique Websites How many different websites will you want to analyze?
? 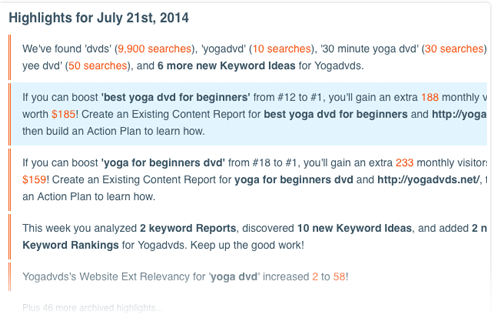 Smarter keyword research The starting point for every new SEO campaign, Keyword Research Reports help you find keywords that offer maximum value with minimal competition, and show you what it would take to outrank the competition.
? 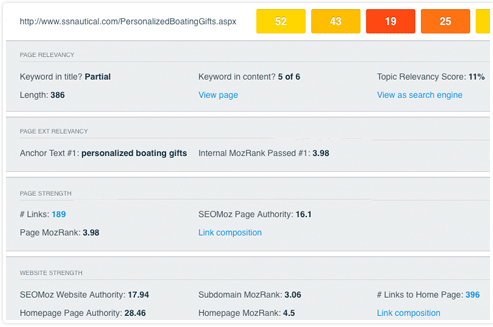 SEO Optimization Reports What do you need improve in order to rank better? Optimization Reports give you specific actionable recommendations to ensure your page is perfectly optimized for your target keyword.
? Content Ideas Get suggestions for new keywords you might be able to target that are less competitive, higher traffic, or higher value.
? 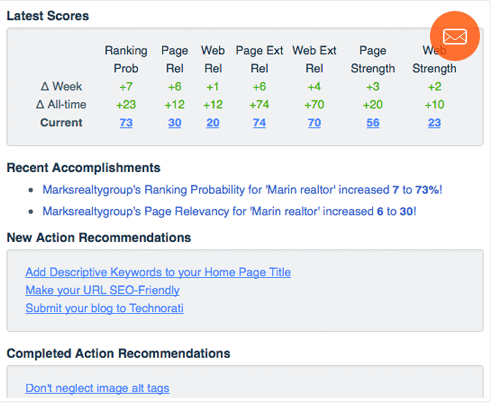 Rank Tracking Track ranking changes for your site and competitors. Uncover untapped opportunities and see how much traffic you'd gain by moving up to the #1 position.
? Link Opportunities Find relevant places to promote your content, scored by authority, relevancy, and the ease of obtaining a link.
? Analyze multiple countries Get keyword suggestions specific to any country you choose, see your rankings in multiple countries, and compare your site to competitors for any country-specific version of Google. Each additional country analyzed requires 1 website credit.
? Online Marketing Performance Identify your website's strengths and weaknesses and biggest opportunities.
? Authority Building Opportunities Become the authoritative source in your industry by connecting with key influencers, earning the highest quality links, and out-promoting your competitors.
? Social Media Opportunities Attract and engage new followers by being the first to share trending content and utilize the latest social media brand building techniques.
? Track your progress Weekly progress reports keep you informed of new rankings, ranking changes, new links, social shares, and your highest priority marketing tasks.
? How do you stack up to the competition? See which online marketing channels are working best for your competition, their strongest links, search engine rankings, and best performing content.
? Startup Love We're a young company working hard to bring more transparency and value to online marketing services for startups, small businesses, and non profits. Join us!
? Help when you need it Need a little advice to get started? Want help building a big picture SEO strategy for your site? Mired in technical issues? Consult with an Expert for no additional charge!
? Results Guarantee We succeed when you succeed. If you don't see results in the first 30 days, we'll refund your money or work with you free of charge until you do.
? Customized branding Replace CanIRank branding with your company logo, website URL, and CTA when sharing reports with clients.
? Try it for Free We succeed when you succeed. Cancel at any time during your first 7 days and pay nothing.
? Monthly Bonus Reports Have a big batch of analysis to do? Bonus Reports can be used for any Report, any time you use up your daily allotment. They reset monthly. Yes, all plans offer a 7-day free trial including the full functionality of the software. If you're not yet ready to put down a credit card, we also offer a Free Forever plan that lets you view a limited number of Content Ideas, Keyword Rankings, and Link Opportunities, create one of each Report type, and get a preview of our top authority building and social media recommendations. Can I change the plan later? Yes, you can upgrade or downgrade at any time and your bill automatically be prorated. 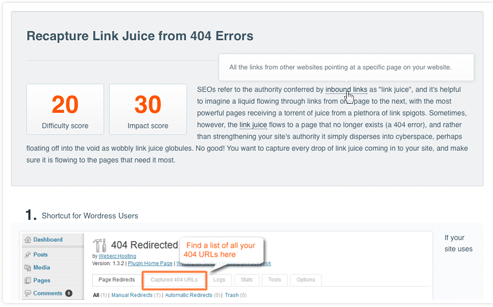 How is CanIRank different than other SEO tools? Other tools provide data. CanIRank adds a layer of artificial intelligence on top to make that data actionable, showing you specifically what needs to be addressed to grow your traffic and search engine rankings. Save time by letting computers handle what they do best (data collection and analysis) so you can focus on the creative aspects of growing your business and keeping your customers happy. On average a CanIRank subscriber who completes at least one Action Recommendation sees a 12% improvement in their search rankings the first week, and a 25% improvement by the end of the first month, in addition to a number of new rankings. Those who complete more Action Recommendations achieve much more! CanIRank shows you how to grow your traffic organically by finding low-competition keyword niches where you can rank without a lot of link building or manipulative and risky SEO tactics, greatly reducing your exposure to search engine penalties or algorithm changes. How are the Service plans different than a traditional SEO / Marketing Agency? Think of us as Uber for online marketing. We use CanIRank's powerful software to track and coordinate the efforts of our online marketing Experts, so you can see exactly what's being done (and why) at all times. No fancy offices, no sales staff, and no hours of "filler" research (we let the computers handle that!) means that your fees go directly to what matters: hiring smart, talented US, Canada, and UK-based marketing experts to handle your critical marketing tasks. No offshoring here! And we guarantee you'll see great results too. Wouldn’t it be helpful if you could know which keywords your competitors are targeting, which phrases Google considers related, and which terms offer the greatest potential specifically for your site? Oh yeah, and could we please sort those by search volume, ad value, and ranking difficulty? 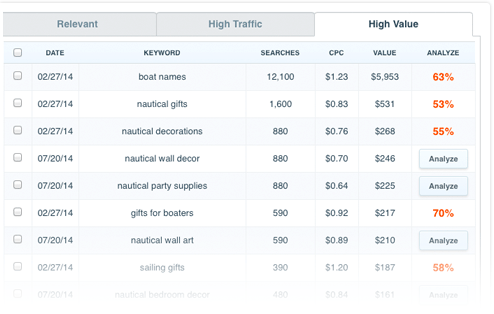 In seconds your Keyword Research is done, automatically, for every campaign you launch. Use Case: Find "low-hanging fruit"
Your time is valuable! Don’t spend it querying 5 different tools and copying results into Excel. CanIRank's SERP Analysis tool collects hundreds of data points for every keyword, including leading paid SEO tools such as Moz and SEMRush. 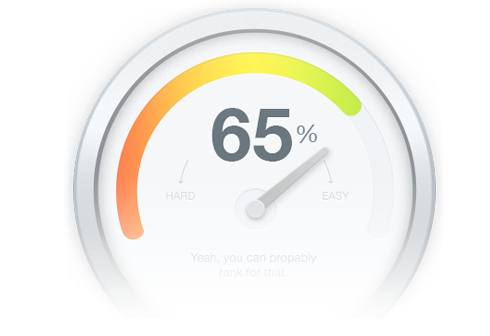 CanIRank's Rank Tracking tool will even dig up your most valuable keyword rankings without you having to manually add them. Best of all, we monitor the results on an ongoing basis and notify you of any changes you need to pay attention to, like rank changes, competitors on the move, or new link opportunities. The best SEOs invest countless hours analyzing search results, trying to understand why sites rank where they do. CanIRank's SEO Competitive Analysis software delivers the same data in seconds, so you can see at a glance what's working and what's not. It's the next best thing to having a search engineer explain the secret sauce in her company's ranking algorithm. Reports are beautifully presented and easily understood, making them an excellent tool for diagnosing and communicating website needs to clients or senior management before each new campaign. Keeping your skills up to date can be challenging when last week’s best practices are this week’s penalty triggers. Whatever issue your site has, CanIRank connects you to an ever-growing SEO Knowledge Base of appropriate Actions customized according to your skill level, site needs, and the historical effectiveness of each Action. As your skills develop or your website’s needs change, we’ll automatically update your Action Plan so you’ll always know which Actions the software predicts will have the greatest impact. Safe, sustainable SEO is a long game, but clients and management want to see results now. How can you balance the two? First, set expectations by using CanIRank’s Competitive Analysis tool to help clients understand what separates their site from existing rankers. Second, explain how your services will help close that gap (using CanIRank’s Action Plan or your own). 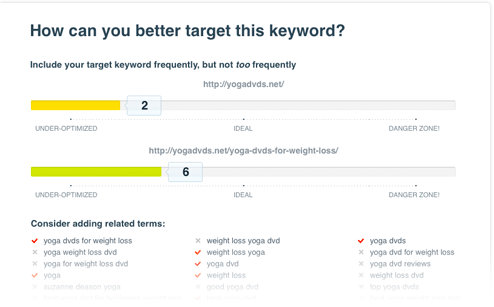 Pluck low-hanging fruit with CanIRank's Keyword Difficulty tool, then focus on doing great work while CanIRank automatically tracks your progress in dozens of key SEO metrics. Even if it takes a while for rankings to appear, your client remains reassured thanks to CanIRank’s weekly SEO Progress Reports with ranking factor score increases, new rankings, ranking changes, and clear explanations of which SEO tasks were completed and how they will benefit the site. If you don't achieve ALL three of these goals, we'll refund your subscription payment and where appropriate give you FREE personal expert assistance until you do. Your browser is outdated and our website will not work correctly! As a small team focused on making the best keyword research tool available, we have to make some tough calls regarding how to allocate our limited resources. One of those calls was deciding not to support outdated and error-prone browsers such as Internet Explorer 6 and 7. Our apologies for any inconvenience that this may cause for you! If you want to correctly view this page, you will need to use a modern browser like Google Chrome or upgrade your browser to the latest version. We think you'll appreciate the benefits not only in using our site, but through improved performance and reliability on other websites too! Thank you for your understanding.